On 17 June 2016, UNU Rector David M. Malone and UNU Centre for Policy Research (UNU-CPR) Director Sebastian von Einsiedel received the “2016 Book Award for Best New Book on the United Nations and UN System” for their co-edited volume (with Bruno Stagno Ugarte) The UN Security Council in the 21st Century. 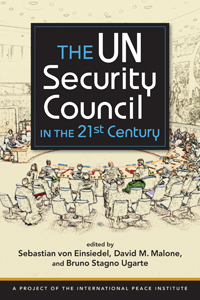 The annual book award is presented by the Academic Council on the United Nations System — a global professional association of educational and research institutions, individual scholars, and practitioners active in the work and study of the United Nations, multilateral relations, global governance, and international cooperation. For more information on the book, visit the UNU-CPR website.